My sister, Riana, has been doing a fun thing all month on her flickr site. Every day in August, she has been preparing something for the Fall/Winter. We both have (and love) Nikki McClure calendars. If you haven’t seen them, they are really beautiful, paper-cut images along with one word that defines the month. The words are weird, almost prescient, because they always seem to sum up the core meaning of a month. Last month the theme was DELIGHT, and man, July was delightful. August’s word is PREPARE, and there is an illustration of some kids working on some projects. Like my sis, I’m squirreling foodstuffs away like crazy. Confiting San Marzano tomatoes, freezing Early Girls, drying kale chips (BTW, the Gundruk made last post got really gnarly. I think I let it go in the jar for too long. Or maybe I got it right but it might be an acquired taste.). 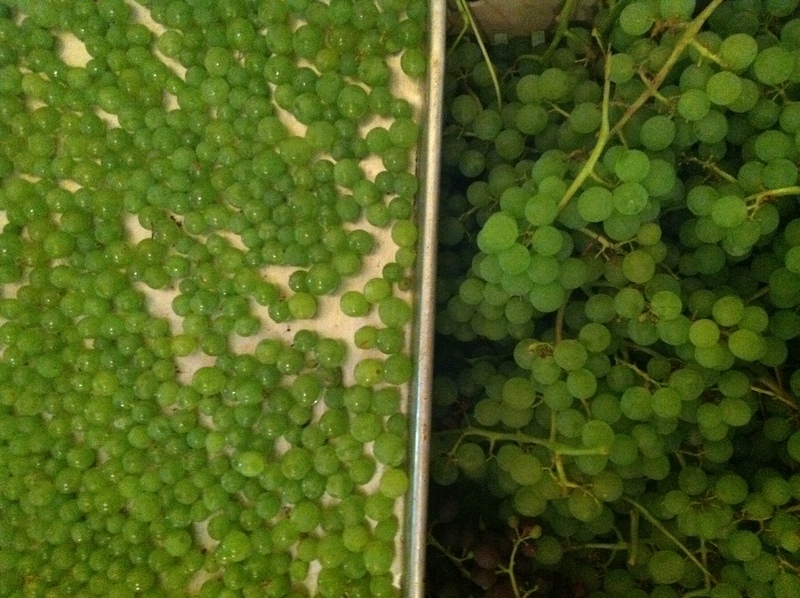 The latest is freezing grapes. A volunteer came from Queens, NY (Thanks Jac! ), and we got to talking about grapes. Should I juice them? Make raisins? Jac said, busy cutting off mildewy pumpkin leaves: freeze them. Frannie helped. It’s really messy. Freezing them actually intensifies their flavor. I have two gallon freezer bags full of them. They taste just like summer. Back to squirreling…. This entry was posted in fruit trees and tagged freezing grapes, nikki mcclure. Bookmark the permalink. Are the corporate sell-out ads really worth it? Yes tripp, that Nikki McClure sure is a corporate money-lover. Making paper-cut art and selling it, just terrible. Re: Gundruk- my wife is Nepali and has made gundruk. I can confidently say that it’s an acquired taste. A little bit like sauerkraut or kimchi, but funkier. I don’t know what yours turned out like, but funky is pretty much standard. I just finished your book, Farm City, and I have to say thank you! Awesome read; informative and funny. I have a small 2 acre piece of land in BC where I do my best to use most of it. We raised pigs for the first time this year, and we become master dumpster-divers! We are processing them soon, and can’t wait to taste the results of our efforts. Seriously, you weren’t kidding when you said feeding pigs this way is like a part time job.